Clothes would need to be high-quality to withstand the frequent use and tough love of 2-year-olds. Clothes would need to be neutral enough to mix and match but still fit the girls’ interests. Buying tiny adorable clothes is fun and I would need to curb my impulse to buy more. It’s important to me that the girls grow up learning what I am just now struggling with in adulthood – more is not better. We should appreciate the things we have, take care of them, and learn to let go of things when it’s time. We create happiness through the experiences we share together, rather than trying to fill our closets with more things. Any words of advice on working toward this goal? 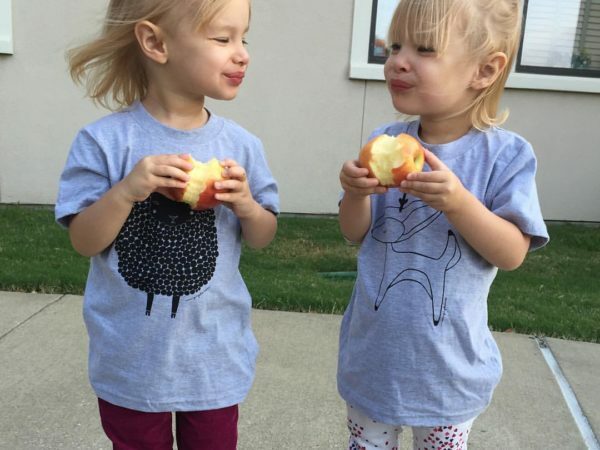 This entry was posted in Parenting and tagged minimalist, twins. Bookmark the permalink. I don’t have the experience to offer advice, but I do LOVE those tiny gingiber shirts!